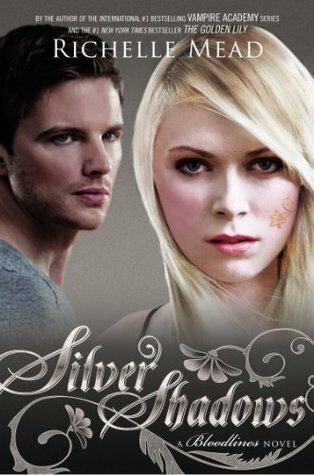 I read Silver Shadows back in August and just realized that I never wrote a review for it. Time to rectify that mistake. I am a Bloodlines addict. As with each book in the series, I was chomping at the bit to get this book. And it did not disappoint. The Bloodlines series is laid out very similarly to Vampire Academy, although the stories are quite different. The fifth Vampire Academy book was my least favorite in the series. While I really liked Silver Shadows, it probably is also my least favorite in the series thus far. As soon as I finished the first book in this series, I predicted the layout for each subsequent book. I was almost positive that I knew what would happen at the end of Fiery Heart and throughout Silver Shadows. I was mostly right. That's not necessarily a bad thing. I have a plotline that I *want* Sydney and Adrian to follow, and I'm pretty pleased that they're following it. Sydney and Adrian are separated for most of Silver Shadows. She is stuck in re-education and he is stuck with his own demons. And a potential love triangle. Eeeeeeeek! I loved the description of the re-eduation center. I was sure Sydney would end up being re-educated at some point, but couldn't imagine what it was like. Richelle did a wonderful job of creating a vivid, truly awful place - far worse than I'd imagined. The world-building was really great in this novel. Not to worry Sydrian lovers. Although our favorite couple is separated for much of the book, there are still several smexy scenes. In fact I got tired of them after awhile. Lately I feel like a lot of YA books are throwing in some hot and steamy scenes that get the heartrate up, but mostly just get in the way of the plot. There's so much interesting going on in this world that I often wished that Sydrian would keep their hands to themselves. But I think I'm in the exception on that. Back to the predictability, I thought it was handled wonderfully. Everything I wanted to happen did happen. And the things I did not want to happen did not happen. And there were a few surprises thrown in. The kind that I wasn't expecting but when I stopped to think about it, they were pretty obvious plot twists. But fun nevertheless. Silver Shadows is basically everything I wanted it to be. Even though it is not my favorite book of the series, I still really enjoyed it. In fact, the only true complaint that I have is that I have to wait until February for the final book in the series to come out. Recommendation: Buy if you're a Bloodlines fan. If you're not, go get Vampire Academy and Bloodlines immediately. I am really enjoying this series and I've realized that I like Sydney more than Rose Hathaway. Great review! I agree with the storyline. There are certain things I want to happen too. I just want the journey to have a surprise or two to keep me on my toes. That's funny because number four was my least favorite in both series. I agree with that there is an overdose of smexy scenes, that is my main issue with Fiery Heart. I understand that some of them have to be in there for relationship and plot development, but there are A LOT of them. I really loved the ending!! !